Emilio Estevez directs “The Public.” Photo Credit:Universal Pictures. My younger sister, Martha, a former librarian told me a few years ago that it’s common for homeless people to come into the library, some with all their belongings and use the computers in the Minnesota library where she worked, although they never tried to stay the night during an arctic blast as in “The Public.” In Emilio Estevez’s film, “The Public,” he serves as writer, director, main star and a producer of the film—I couldn’t help but think of my sister in this same situation here in America—and wonder what she would do. 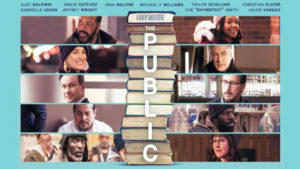 That’s the beauty of this engaging, timely film “The Public,” you’ll find yourself taking a side. 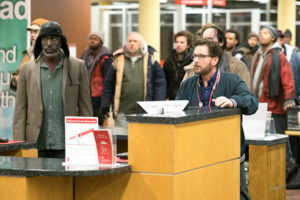 With the emergency shelters at full capacity during dangerously low frigid temperatures in Cincinnati, Ohio a large group of homeless library patrons led by Jackson, (Michael Kenneth Williams), decide to stay put in the library at closing time. This non-violent occupy sit-in or sleep-in, becomes an act of civil disobedience. Intensifying into a standoff with local riot police led by crisis negotiator (Alex Baldwin) and a politically motivated district attorney (Christian Slater), two librarians Emilio Estevez and (Jena Malone) find themselves caught in the middle. Estevez plays mild-mannered librarian Stuart Goodson, who deals with homeless men and women every day at the public library in Cincinnati. He’s required him to appease the unruly homeless, which he does in a practical matter although he draws the line where bad body order comes into play and removes a homeless man who has filed a substantial lawsuit against the city. Stuart has a solid, likable work relationship with Myra (Jena Malone), a junior librarian, though she’d like to transfer to a different floor. We also view his budding relationship with a neighbor in his apartment building, the easygoing Angela, (Taylor Schilling). Although Stuart’s character arch unfolds in layers and is satisfying, it’s also equally enjoyable that secrets are revealed much later in the script. An essay by a now-retired Salt Lake City librarian Chip Ward, “How the Public Library Became Heartbreak Hotel,” published in The Los Angeles Times, April 1, 2007, inspired Estevez to write the script. Serendipitously a book on the topic was published about the same time as the film’s release, “The Librarian’s Guide to Homelessness: An Empathy-Driven Approach to Solving Problems, Preventing Conflict, and Serving Everyone” by Ryan Dowd Executive Director of Hesed House the 2nd largest homeless center outside of Chicago, Illinois. It’s no surprise that Estevez and Dowd have teamed up to help publicize the movie visiting twenty-one cities and conducting over thirty Q&A’s. The film is unique in that the topic hasn’t been covered in a feature film; the homeless characters as portrayed are multi-dimensional, Chicago resident Che “Rhymefest” Smith’s character suffers from mental illness. Incidentally, the film, “In My Father’s House” a superb documentary we learn first hand about homelessness as Smith’s father is homeless in the film. The homeless library patrons are depicted on a wide spectrum, a naked man singing, a drug addict, a veteran, a down on his luck job-less situation, and an eccentric older woman. The cadre generates an understanding and at the core, invokes empathy. An unimaginable nightmare for most, yet, the reality is in the numbers and the facts. Certainly we need more films on America’s homelessness to truly get the point across, and to keep the topic in the forefront, Will Smith’s excellent “The Pursuit of Happyness” (2006) centers on him and his son (Jayden Smith) as a father and son living homeless, based on a remarkable true story. 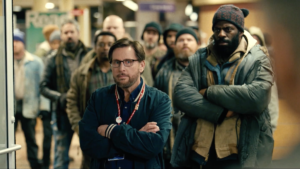 The Bottom-line: Estevez ensembles a terrific cast and script, the on-target performances raise questions, spotlights the homeless/library issue while tugging at the heart of the matter—and best of all, forces us to analyze the situation— to make our own personal reactions. Cast: Emilio Estevez, Michael Kenneth Williams, Alex Baldwin, Christian Slater, Jena Malone, Jeffery Wright, Gabrielle Union, Taylor Schilling, and Jacob Vargas.